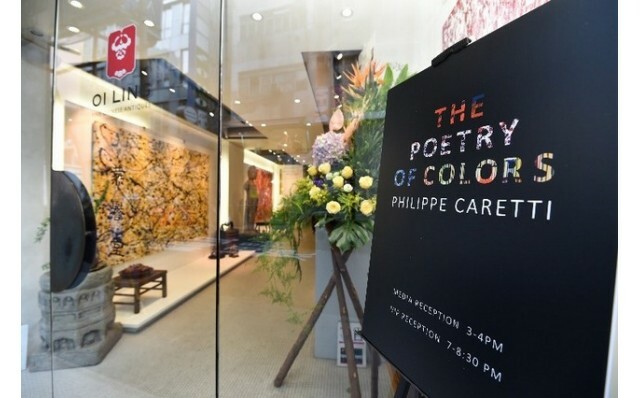 Oi Ling Antiques presents The Poetry of Colors, the inaugural collection of paintings by Asia-based Swiss artist Philippe Caretti, from March 22nd to April 22nd 2018. The Poetry of Colors is reminiscent of the action painting, or gestural abstraction, of the mid-20th century, which is a style of painting that paint is spontaneously dribbled, splashed or smeared onto the canvas, with artist’s choice of tools, rather than being carefully applied. But one of the collection’s distinctive element is Caretti’s unique and unusual choice of tools: syringes. The paint is first drawn into the syringe, and afterwards, skillfully expelled to form the envisaged lines, swirls, dots, blotches, or patterns. To the artist, the unpredictability of mishaps in the process of artistic creation resembles the uncontrollable in one’s life, and the challenge of creating something from those unpredictable moments is an invigorating and eye-sharpening process. 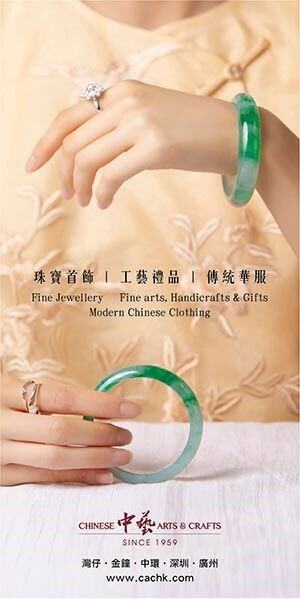 The collection celebrates the way of life and wisdom of Asia, a place where Caretti has lived for more than 20 years, and which has shaped him irrevocably more than any other place. 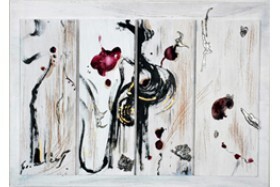 The artist’s explorations in this collection are informed partly by his interest in the idea of Tian Ren He Yi (天人合一), or the oneness of heaven and humanity, which is part of a long-existing tenet of Chinese philosophy that maintains that there are three intelligences of Heaven, Earth, and Human. Caretti is drawn to the implications of this concept: the heart, mind, and the universe must be one in an artistic creation or any part of creativity. A unity or partnership of man with nature. The role of the artist is to enlarge his vision and to utilize his skills, but the mishaps, slips, and tumbles of the pump of the syringe, and the rest, is left to “heaven,” so to speak. 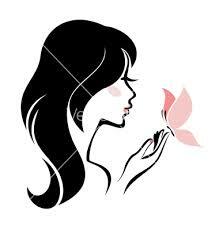 Come what may, the artist accepts them alongside his own outpouring of artistic energy. Caretti studied architecture in Geneva, Switzerland, but turned to be in the hospitality industry for the next 30 years. However, his creative roots have remained, setting the stage for his passion in painting and artistic pursuit in later years. His unconventional path to becoming an artist has been an organic process of exposure to insights and perspectives on aesthetics. 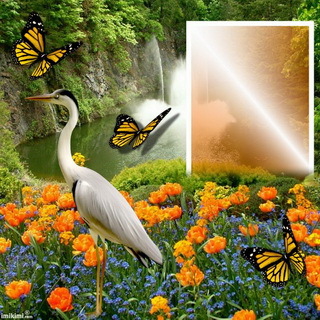 The Poetry of Colors is divided into 4 stanzas, namely Communion, Taking Form, Coming Together and The Garden of Eden. The collection features a selection of paintings that are playful and unapologetically bright, and it is a reflection of the innermost emotions of the artist. Mr. Reto Renggli, the Consul General of Switzerland to Hong Kong and Macau, Mr. Gabriel Mallet, the President of The Swiss Chamber of Commerce in Hong Kong and Ms Oi- ling Chiang, the Curator of the exhibition attended the Opening of Swiss Artist, Philippe Caretti’s inaugural Exhibition The Poetry of Colors. Philippe Caretti presented one of his syringe artworks, My Earth, to Gabriel Mallet for charity purpose. 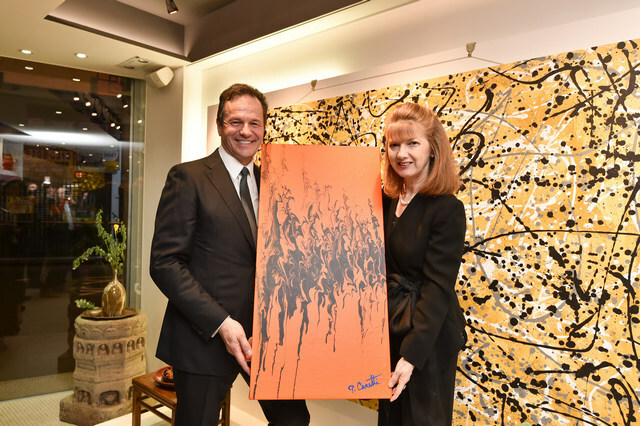 Dr. Jennifer Cronin (right), the President of Wharf Hotels, deeply impressed by the emotions and vibes conveyed in Positive Vibes, purchased the painting right at the VIP Opening Reception of the exhibition. Visitor appreciating the exhibits of “The Poetry of Colors”. 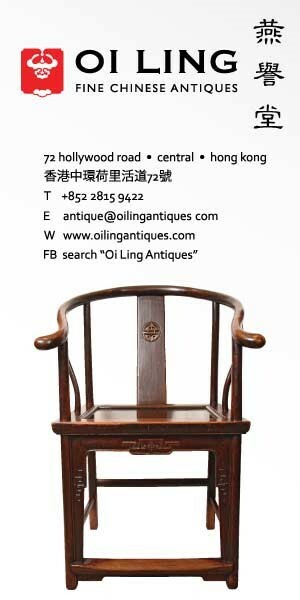 The Poetry of Colors will be exhibited from 22 March 2018 to 22 April 2018, at Oi Ling Antiques in Central.